Musical theatre is a risky undertaking. So many parts must seamlessly meld together in order to make a show sing, and one small crack can derail the entire operation. This is particularly the case in commercial Broadway theatre, where it’s all a big numbers game. As a result, there’s a landslide of flop musicals out there. However, that doesn’t mean these shows are bad. Ok, in many cases the shows are bad (In My Life, anybody?). But what usually comes out on top is the score — and many of these flops have world-class scores that deserve recognition and presentation. In Nobody’s Side: Broadway’s Cult Classics, a new cabaret show at Davenport’s Piano Bar and Cabaret (with one more performance left on March 28 at 8pm — get your tickets here), that’s just what four fiercely talented performers do. Under the direction of Christopher Pazdernik (who also serves as the evening’s host) and music director Aaron Benham, Katherine L. Condit, Ryan Lanning, Elizabeth Lanza and Sean Effinger-Dean (the latter two are currently starring in Porchlight Music Theatre’s Meet John Doe) perform a wide-ranging evening of flop musicals. With so much material to draw from, Pazdernik paired down the flop selection using the following three criteria: to be considered, the show must 1) have run on Broadway less than a year; 2) never have had a Broadway revival or motion picture; 3) still remain part of the musical theatre repertoire. In fact, Condit was the biggest surprise of the evening. While I’ve seen her in a few things over the past year, this is the first time I’ve seen her really shine — this woman has one hell of a voice. And, thanks to Pazdernik’s deep respect and understanding of musical theatre lore, he treats us to a mini-performance of the 1988 mega-flop, Carrie, where Condit gets to show off her range performing “And Eve Was Weak” (alongside Lanza as Carrie) and “When There’s No One” with equal parts passion and pathos. This small taste leaves you wishing some Chicago storefront could get the rights to produce the show with Condit starring as Margaret White. Minor quibbles: The opening number — a witty arrangement by Benham mixing together “Oh, The Thinks You Can Think!” from Seussical the Musical and “Come Look at the Freaks” from Sideshow — made me long for more creativity. While good material and strong performances are all one really needs for a solid evening of cabaret, a few more original arrangements could take it even further — and they clearly have the potential to do so. And while Pazdernik does lump numbers together in themes, maybe a bit more thought about what those themes are and their order might help guide the performances. Right now it just seems random. Fun — but random. At any rate, this is the third cabaret production I’ve seen created by Pazdernik (read my thoughts on The Distance You Have Come: The Music of Scott Alan and It’s an Art: The Songs of Stephen Schwartz), and each one keeps getting better. The biggest things he has going for him are his winning personality, material selection and pairing of performers to material. If you like musicals and/or excellent cabaret, catch this show next Monday, March 28 before it’s gone. 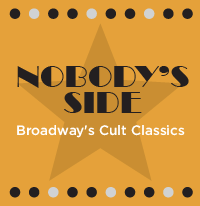 “Nobody’s Side: Broadway’s Cult Classics” has one more performance on March 28, 2011 at 8:00 pm at Davenport’s Piano Bar & Cabaret, 1383 N. Milwaukee Avenue, Chicago. Tickets are available by calling 773-278-1830 or by visiting davenportspianobar.com. Tickets are $15 with a 2 drink minimum.